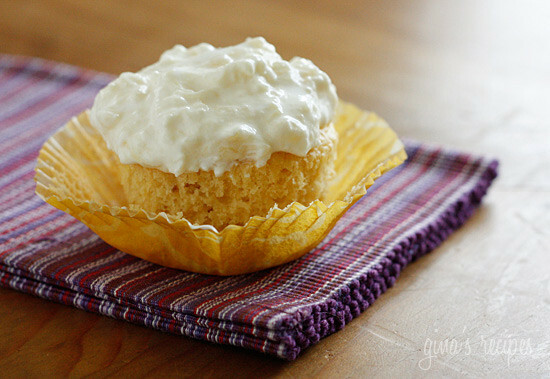 These low fat cupcakes are moist and delicious and you won’t believe how easy they are to make. 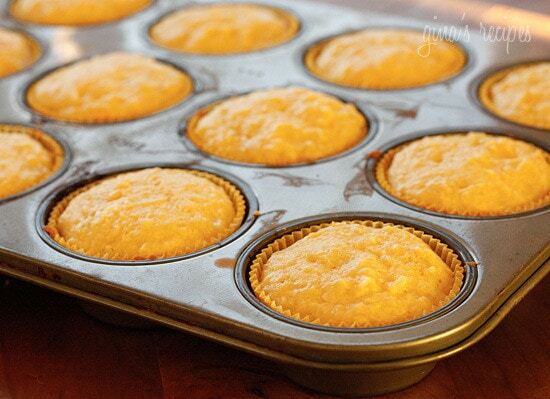 All it takes is a box of yellow cake mix and a can of crushed pineapple; no eggs, no oil or butter needed!! You can simply eat them with Cool Whip or make them blissful as I did here with my pineapple fluff cream cheese frosting! I always laugh when I have to come up with names for recipes. I could havce simply called them Pineapple cupcakes, but I think they are so much more with this topping. 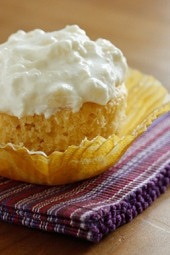 You can make the cupcakes a day ahead and the topping as well which should be stored in the refrigerator. Once you top them with the frosting they should be eaten within a few hours. Combine both ingredients in large bowl. Mix on medium speed with electric mixer. Combine cream cheese, crushed pineapple and marshmallow fluff in a medium bowl and mix with a hand mixer until combined well. Hi. Sadly, the SP are 4, not 2 as posted. And thats just for the cupcake. That being said, TOTALLY WORTH IT! I think I ate 8 SP in batter alone 8-O. But so yummy! Ha! I will double check this. These cupcakes taste amazing and are insanely easy to make. I made them in two batches since I only had one tin for 12 cupcakes. The cake mix (Supermoist) gave a range of times (12 – 17 mins) and temperatures (325 for lighter pans/350 for darker pans/glass). I used light pans with cupcake liners. The first batch I cooked at 325 for 15 mins the second at 350 for 16 mins. The first batch fell a little in the middle and was a tad underdone, the second bath puffed right up and looked great – so if I do it again I will definitely tend towards the higher temperature oven and leaving them in a little longer. Also as the batter sat in the bowl for the second batch while the first batch cooked it seemed to rise a little which might have helped with the puffiness of the second batch. I might let the batter sit for 10 mins or so in the bowl if I do it again. Great easy recipe for easter. 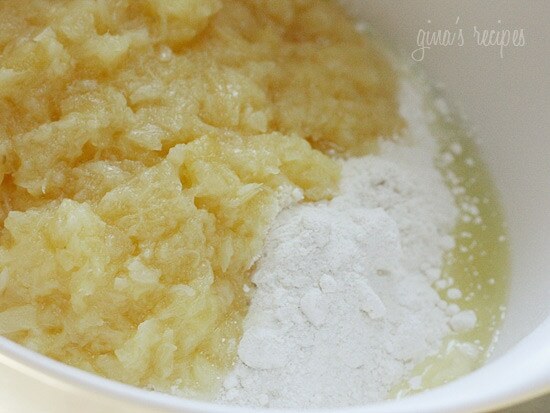 The trick for a thick pineapple icing……..Make the icing in advance and refrigerate in a covered bowl overnight. It becomes much thicker and is real easy to spread. Also, this icing recipe makes a great dip for fresh pineapple and strawberries. It stays fresh in the refrigerator for a week in a covered bowl. Hi. These look fantastic! Great dessert for Easter. Do you have the freestyle smart points value? I am going to make these with my Holstein treat maker machine to see how they come out. I wonder if I put 1/4 tsp brown sugar and tsp crushed pineapple with a diced cherry if they will come out like little pineapple upside down treats. We’ll see. I can’t find the size cake mix that’s yiur recipe calls for. I can only find 15.25 oz. Should I just cut back on the pineapple? could you sub Truwhip instead of fluff? How many smart points? Thank you, love all of your recipes! I made these cupcakes and the icing last night and everyone loved them. Its great that they are a low fat recipe. I did make one change, I used a box of pineapple cake mix instead of yellow cake mix. I think next time I am either going to put the drained crushed pineapple in my magic bullet first or just leave it out of the recipe. I didn’t like how chunky the icing was. It kept clogging the pastry bag tip and I couldn’t make the icing pretty. I think I will cut pieces of a pineapple ring and garnish the top of each cupcake. I haven't eaten these yet but the batter tasted amazing! I am so excited to take these into my Weight Watchers meeting tomorrow. It's our temporary leaders last day and she mentioned wishing someone would bring her cake lol! I used Pillsbury Sugar Free Classic Yellow cake (because it is what I had and I like the way it tastes) and it makes the cupcakes without icing 2 points plus, and the cupcake with icing 3 points plus total. Hi Gina, I made these cupcakes tonight and my boys loved them, they were amazing!! Made these today for a birthday party at work. They were delicious and everyone loved them! Thanks for the great recipes Gina! These are delicious and moist! One of my favorite sweets from your site. Thank you and keep doing what you do, I love your site and don't know what I'd do without it! Can I make in a 9×13 pan instead of cupcakes?? These are going to be my go to cupcake for any event. They are awesome and nice with no egg or oil. I made a coconut butter-cream frosting. 1 stick of butter, 2-1/2 cups confectioners sugar, 1-2 tsp vanilla extract, 1/8 tsp salt, and 1/3 cup Cream de coconut (I found it in the Hispanic section of the grocery store. Beat the butter until smooth, add about half the sugar, then add the extract, vanilla and salt, beat until smooth and incorporated then add remaining sugar. It was a nice contrast to the cupcake. If you wanted more coconut you could add some flakes (sweetened might be too sweet but it could be tried. I make these and they are great. My topping is 1 small package fat free, sugar free instant pudding; 1 small container fat free cool whip and one large can of crushed pineapple w/juice. Mix all three ingredients together. Put on top of cupcake and top with fresh berries – strawberries, blueberries, blackberries. Delicious and low in WW points! I just made this cake today..All i can say is,I love love love it!!!!! I made these for a summertime dessert last night…they were a hit! 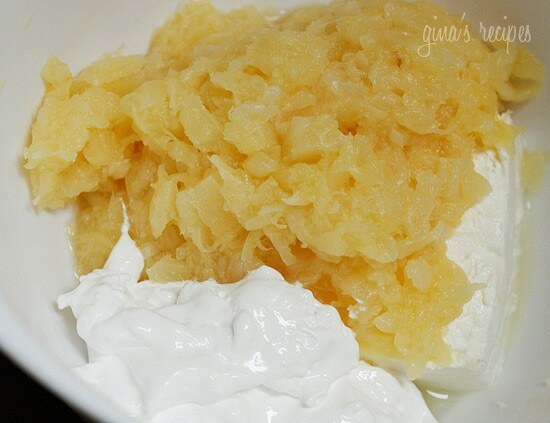 Instead of the frosting recipe provided, I used 1 tub of fat free Cool Whip, I can of very well drained crushed pineapple, a half teaspoon of coconut extract, and one small box of sugar-free vanilla instant pudding. Topped them with toasted coconut! Amazing! My 8 year old and I just made up a batch of these for the 1st time. They are delicious! He likes them without icing and I love them iced…so rich:) The only problem being…I could eat way too many at a time! Thanks for sharing! Has anyone successfully turned this recipe into a cake? I was hoping to use this to make smash cake for a first birthday. The baby is not watching his weight but I liked the idea of a slightly healthier cake. can i make this with the sugar free cake mix? i am trying to cut out as much sugar as possible. P.S I love all the recipes I have tried so far! These are so good. I made and iced them yesterday to serve at a gathering today–they were a huge hit. So rich and moist. The icing turned out great–after reading the posts about it not setting i made sure to get all the moisture out I could and it worked! These might be my fav cupcakes ever! Well, I totally screwed up the topping:( I drained my pineapple but it was WAY TOO watery and I had to throw it out. I think next time I'll use a small can of pineapple tidbits rather than crushed. My husband LOVED the cupcakes without the topping and they were gone in a few days. I personally didn't care for the texture, neither did my toddler. I made these last night without the topping. They are so light. Perfect for when I am craving a piece of cake and don't want to use a day's worth of points. Love them. I absolutely loved this! Thanks for a great treat that will not ruin my weight loss! Do you think this recipe would work as a cake too? Or just cupcakes? My father loves pineapples and his birthday is the weekend. I thought I could make his birthday cake from the recipe but I wasn't sure if the consistency would hold up? I seen this on YouTube a few years back and never thought to try it. Now I have to try it! Usually all your recipes work like a charm, but this was wasn't as edible. Like, everyone here had a piece and didn't really complain, but half the batch was thrown away 4 days later because nobody would eat any of it. 🙁 The only canned pineapple I could find (I'm in Brazil, so canned things are… hard to find, and I was afraid fresh pineapple wouldn't have enough juice in it to work in this recipe) was sliced. I used a processor to "crush" it, and then followed the rest of the instructions. While the flavor was "okay", the texture of the cake was really weird… gooey! I'm not sure what really went so wrong, but this was a little disappointing. I'm still forever thankful for all the other recipes though (like the BLT pasta salad, which is all my families favorite thing now, we make it at least once a week for over 3 months now). those look heavenly! I am going to have to make those… soon! : ) thanks for sharing! Hey Gina, I'm looking forward to trying these! I'm trying to avoid processed foods though; do you have a recipe for homemade yellow cake mix that could be used in place of the Betty Crocker mix? Thanks! These are amazing! My husband, who is not usually a fan of any dessert that does not include chocolate, raved about them and asked how soon I could make another batch! I skipped the frosting, and topped them with some lite whipped topping (which I flavored with a couple drops of coconut extract) and maraschino cherries. The only problem is figuring out how limit myself to just one serving!! I just made these tonight and I love them. I added a pinch of coconut to the top and it's a great extra. I am so happy I found this website! I love your recipes! I am not on WW but try to maintain a healthy lifestyle and your recipes are better than a lot from Cooking Light. These are AMAZING! After making your pumpkin muffins for a bake sale in fall and getting great reviews, I decided to try these for a bake sale this weekend. I made them without the frosting last night and tried one this morning. They are better that the last full fat "regular" cupcake I had! These pineapple bliss cupcakes were absolutely delicious! My husband must have eaten 5 of them as soon as the frosting went on. I only used 8 oz. drained crushed pineapple in the frosting and I thought it was perfect. Thanks for sharing this recipe, Gina. It was fabulous!!! This was the first recipe from your website that I tried. If this recipe is any indication as to how tasty your dishes are, I know I won't be disappointed! These were delish! I made them with your coconut icing instead. Yummy. I had to buy a Duncan Heinz cake mix because that box was the right size and the Betty Crocker was smaller. Made these as a lighter dessert for Easter…DELICIOUS! Went with confectioners' sugar and Cool Whip as toppings, both worked great…so moist. Just finished off two more. Thanks for a tasty, EASY recipe. these are fabulous!! So moist and no need for the frosting. I made them in regular cupcakes and mini's, which perfectly fit in your mouth. I also used your concept with a lemon cake mix, 1 cup of unsweetened applesauce, 1/3c water, and 2c fresh blueberries….yum!!!! Amazing! I didn't make the frosting, but the cupcakes themselves taste just like pineapple upside down cake to me. Definitely can't tell they are low fat/cal. Boyfriend loved them too (score)! I used a little whipped cream on top or just ate them plain. I did have to bake a lot longer than directed to get them done. Thanks for the recipe! Perhaps you didn't bake them long enough. Mine were very doughy for quite a while. The package said bake 19-23 minutes. I think it was closer to 30-32 minutes when all was said and done. Made these last night for the first time and they were AWESOME! So moist and I couldn't even tell that they were low cal. Will definitely be making these again soon. I am making these for st. patty's day with a bit of green food coloring it it… and bought some green marashino cherries to go on top of each one! Thank for this recipe they sound delish!! These are wonderful, I went with a ff whipped cream for the topping. My family loved them. I didn't have time to make the cupcakes, so converted it to a 9 x 13 dish. I made sure the serving sizes were cut so that there were 24 pieces (like I would have 24 cupcakes). I took it to church and even those not watching their weight really enjoyed it. Gina, are the points listed just for the cupcakes, or for the cupcakes + the frosting? THANKS! Oops… just saw that you listed it both ways. Thanks for all your wonderful recipes! Could I use the dry ingredients in a yellow cake recipe instead of box cake mix? Made these today and they are awesome!! I just love the texture and they are super easy to make! Will definitely be making them again! Just making sure I'm reading this correctly…you mix ONLY the boxed cake mix (no added oil/eggs/water per package directions) with the pineapple? Lauren, yep! Just box mix and pineapple! I loved these! Very moist and pineapple-ly. I made half a batch, weighing out the cake mix and the pineapple, and used the rest of the pineapple in the frosting. This reminds me of my husband's favorite birthday cake, so I may try to tweak the recipe when his birthday rolls around. Thanks for another winner! I made these last night and they were a BIG hit! They all said they taste like pineapple upside down cake which by the way is their favorite desert. The frosting was a bit runny for me also but none of cared. It was still awesome! I will try the paper towel trick to get the moisture out next time or even try a tiny bit of brown sugar sprinkled on top and add drained cherries to the frosting to make it more like upside down cake. Even my guy (who hates diet meals) ran to his computer and pulled up this site to see what else he would like. I have made a few meals already and he loved them. Thanks so much!!! Oh my gosh! I found this recipe to make for our Bible study group coming over tomorrow night, and I haven't even made the frosting yet, but my husband and I already ate a few, so I might have to make more tomorrow to make sure there's enough. I saw someone post that it didn't work well in a cake form. I was hoping to use this recipe for my son's birthday cake next week, and I am not doing cupcakes but a regular cake. Any way to make it work for that? I love the pineapple flavor! I just made these…they were amazing!!!!!! My icing was a little runny…but i think a night in the fridge will do the trick. You HAVE TO TRY THESE!!!! YUUUUMMMMM!!!!!! These are so good!I just made them Saturday (today's monday) and we only have 1 left! (i only made 12 but still!) These are absolutely fantastic and I will definitly be making them again! I made one small change and saved about 1/4 of the can of pineapple and mixed it with a can of cream cheese icing and it was absolutely FANTASTIC!!!!!!!!! yum yum yum!!! Also, I just posted this to pinterest and it already has a TON of hits! Just made these – delicious and refreshing! For the frosting, I drained the pineapple so well that once I mixed it, I needed to add juice back in. The cream cheese flavor was too strong. Got it right by adding juice back in. Not sure why the cupcakes stuck to the wrappers though (slightly, but enough to make it messy!). Any ideas? WOW! I made these for my mother's birthday dinner (we are both on Weight Watchers), and they were a HUGE success! Everyone loved them! They were so moist too! My 15 yr old niece went crazy over them too (as I had to give her some to take home). The only problem I found was that Betty Crocker cake mix (at least in my store) was only 15 oz, not 18.25, so I got Duncan Hines cake mix instead! This is definitely a keeper! These are fantastic! I just got them out of the oven and my husband attacked them right away! I think I probably should have baked them a little longer but still so good. You're the best! Just made these & did not care for them..my son will not eat them either. 24 cupcakes w/ frosting into the garbage. Bummer! These are sooo good!! I have not made the recipe in cupcake form, but have made it 3 times now as a cake, and WOW, everyone goes nuts for it!! I did modify the icing, and used lite whip cream, sugar free pudding mix, a cup of milk and a small pineapple; I believe it kept the calories around the same! So far this and the banana cream pie have been huge hits, and I have picky eaters! THANKS!! I couldn't believe you could make cupcakes without eggs, milk, oil and/or butter but this is fantastic! Not only tasty but so quick and easy especially with a store bought cake mix- thanks Gina! OMG I love these cupcakes. I made them for my daughters birthday for the 1st time. They were a home run… Now my boyfriend is asking me to make more cause we are both watching what we eat and they are perfectly sweet with out the frosting and hit that sweet tooth nerve just perfectly at the end of the night. Thank you!!!!!!!! 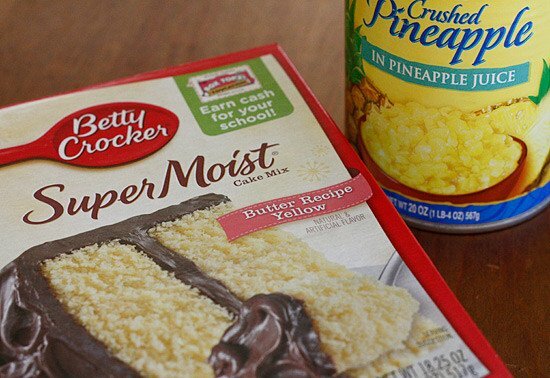 do u need to make the cake mix according to the directions (add eggs and oil) and then add the pineapple? I made these today–except I used fresh pineapple and about 3 decent sized splashes of organic pear juice–and they were amazing! I was a little skeptical, since there are only two ingredients, but wow. They are surprisingly moist (like stick to your fingers moist), and oh-so-yummy. Next time I'll be sure to make the topping to go on them! Ok yep, it's me again–I made a version of these this weekend, and had to share. 1 box carrot cake mix, 20 oz can of manderine oranges DRAINED. I smashed the oranges with my potatoe masher, added the cake mix and a tiny splash of orange juice. They were YUMMMM! Trying to decided between these and your pineapple bliss for our work cookout Wed. I made these for an office party and everyone loved them. Super easy to make and the taste is amazing! OMG YUMMMMMMM I made these last night. My almost 2 year old ate 3 of them! (I made the mini cupcakes) Didnt frost them and they were perfect without frosting! Thank you so much for your site!!! Best cupcakes ever. I made them this weekend and already want to make another batch! they were a HIT at the party. These cupcakes are magical! I posted them on my blog today (www.mimisfitfoods.com). Thanks for the recipe! Do the cupcakes freeze well without frosting? These cup cakes are awesome. First recipe I tried and not my last. So great to find easy and very tasteful fat free recipes. Keep up the good work Gina! I love this idea…I came up with a cupcake recipe, using your idea. I wanted to let you know that I linked backed to this recipe…delish! I guess healthy may not best describe this recipe, more like low fat but with all that pineapple, it's good enough for me! Thanks Gina! I made these for a potluck at my husbands office. They wanted "healthy" items & I have wanted an excuse to make these. They were a BIG HIT! There were a few grumbles about cupcakes at a healthy potluck, but it was explained what they were, and I printed off a copy of the recipe for those that wanted it. I even made a 2nd batch with the gluten free mix from Betty Crocker for my husband, it also turned out good. Well I am happy to hear that! I'm super late with my comment, as I made these DELICIOUS cupcakes for Easter, but I just wanted to let you know how awesome they were. I let my pineapple drain for a while and then squeezed them with paper towels and I had no problem with my icing. The cupcakes got rave reviews from my whole family…in fact, my grandma wanted to take a dessert to go, and my uncle told her if she was just going to try one dessert, that the cupcakes were the way to go!